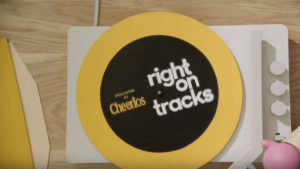 Cheerios has launched its ‘Right on Tracks’ campaign – a content series meant to further the brand’s mission of spreading positivity. In a time where kindness and compassion seem to be needed more than ever, Right on Tracks consists of four music videos designed to help parents, guardians or teachers spark conversations with their children or students around empathy, inclusion, and kindness. To bring this concept to life, Cheerios and creative agency 72andSunny teamed up with The Walkmen’s Walter Martin to create the four original tracks for Right on Tracks; director Johnny Kelly from Nexus Studios then crafted the unique films, pulling in the help of art collective Nous Vous and Isle of Dogs puppet master Andy Gent. It’s All Family is meant to open kids’ eyes to other family dynamics beyond their own, touching on everything from adoption to foster siblings to parental relationships, and reiterating that everyone and every family is different and that’s okay. Sit With Someone New encourages kids to step out of their own comfort zones to help make others feel welcome. This song shows kids that they might learn something new, or make a great friend by keeping an open mind when it comes to who they hang around. Just Be You touches on the idea of growing up and discovering who you really are. Rather than conform, this song encourages kids to be proud of who they are – even if that might be considered “different” from those around them. Step Up both acts as an anti-bullying rally song, as well as an easy-to-follow tool for kids who aren’t sure how to approach a situation involving a peer or classmate being picked on, whether in the classroom, on the playground, or online.